*After more than 18 years at the pinnacle of the NEW YORK sports-talk radio scene, "Mike and the Mad Dog" are history at WFAN (660). Mike Francesa and Chris "Mad Dog" Russo spent very little of the summer working together, separated by alternating vacations amidst newspaper headlines suggesting increased tension between the long-running co-hosts. And then, on Thursday, the memo came out - Francesa had signed a new long-term contract to stay at WFAN, while Russo was gone from the station that made him famous. Russo's next career move is unclear right now. While rumors have him heading for satellite radio - and a noncompete clause in his contract (which remains in effect) bars him from competitor WEPN until next spring - the Dog was back on the WFAN airwaves Friday, calling in to his former show to say goodbye. 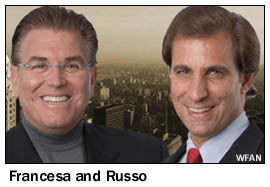 Francesa, meanwhile, becomes the solo star of a show that thrived on his tension with his former co-host. While there will new cast members added to the afternoon shift by the time the show relaunches Sept. 5, Francesa says they won't fill the same co-host role that Russo did. For now, Francesa's show will continue to be simulcast on the YES Network (which replayed the Friday call-in several times). For WFAN, this is just the latest disruption to a program schedule that had been set in stone for almost two decades. The station's morning shift, now featuring Boomer Esiason and Craig Carton, is still struggling to recapture the ratings and revenue Don Imus brought in for years - and rumors continue to circulate that the Mets, a staple of WFAN's lineup since the station's debut in 1987, may shift flagships next year. *In Syracuse, Citadel's WAQX (95.7 Manlius) is advertising for a new PD, but CNYRadio.com reports that the current occupant of that chair, Alexis, isn't leaving 95X - she's remaining on the staff as midday host while handing off the programming reins. There's a big Citadel change in Binghamton: after a quarter-century at WAAL (99.1), most of that time in afternoon drive, Thunder Reynolds has exited the classic rock station. In Ithaca, Saga's WHCU (870) is shuffling its morning lineup, replacing Dennis Miller (10-noon) and the last hour of its local morning show with Glenn Beck, who'll now be heard from 9 AM-noon. Dave Vieser and Geoff Dunn will continue to be heard with "Morning Newswatch" from 5:30-9 AM. WHCU is also looking for an assistant news director to fill the shoes of Greg Fry, who's moved to the Albany market and a new news job with Clear Channel's WGY. Here in Rochester, we've got "November 17" marked on our (Tower Site) calendars - that's the date Brother Wease will apparently be back on the air at WFXF (95.1 the Fox). On Thursday, current morning man J.P. Hastings (who'll move to afternoons once Wease takes over) announced that the "95-day countdown" to Wease's return had begun. 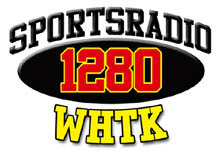 And what happens when the "Mike and Mike" morning show at Clear Channel sister station WHTK (1280 Rochester) moves over to crosstown WROC (950) with the rest of the ESPN Radio affiliation? In the Finger Lakes, Bob Savage is now syndicating the Bill Nojay talk show that airs daily on his WYSL (1040 Avon) from 2-3 PM. Nojay's show is being heard at 3 PM on WLEA (1480 Hornell) and on a one-day delay at 11 AM on the Finger Lakes News Network (WGVA 1240 Geneva, WAUB 1590 Auburn and WFLR 1570 Dundee). Speaking of WFLR, its AM signal was off the air due to transmitter troubles last Wednesday, and that gave us a chance to hear the AM programming being relayed over its new translator, W245BL (96.9 Dundee), with a signal that reached all the way up to Waterloo. For now, W245BL is usually relaying WFLR-FM (95.9 Dundee), but when that FM signal moves to Ithaca (as Odessa-licensed 95.5), the 96.9/1570 combination will replace the current WFLR-FM for Dundee/Penn Yan listeners. The Buffalo Broadcasters have announced the lineup of honorees for their next Hall of Fame induction, to be held Sept. 23. This year's roster: pioneering sportscaster Roger Baker, talk host Art Wander, WKBW-TV program manager John DiSciullo, former WGR-TV weatherman Father Barry Lillis, NFL star/ESPN commentator Ron Jaworski, Regent chief engineer Bill Stachowiak and WKBW-TV itself, which celebrates its 50th anniversary in November. The induction ceremony will be held at the WNED-TV studio, with Don Paul (WIVB-TV) and Sue O'Neil (WKSE/WTSS) as masters of ceremony. Back downstate, Reg Osterhoudt adds PD duties at WBWZ (93.3 New Paltz) to his job as operations director of Clear Channel's Poughkeepsie cluster; Aaron McCord drops the WBWZ job to focus on his PD work at sister stations WRWD-FM (107.3 Highland)/WRWC (99.3 Ellenville). When Le Roy Akins died last Sunday morning (Aug. 10), he was remembered for his most recent job: for the last two years, he's been mayor of Glens Falls. But as a teenager growing up in Glens Falls, he was "Roy Lee," boy DJ at WWSC (1450) - and from 1964-1971, Akins engineered and produced J.J. Jeffrey and George Michael's shows at WFIL (560) in Philadelphia. Akins later went into marketing before beginning his political career. He was 66. Guy LeBow, who died Aug. 14 at 92, had a broadcasting career that included TV and radio sportscasting, acting, writing and even station ownership. LeBow recreated Giants baseball games on WMCA after the team relocated from New York to San Francisco in 1957, broadcast sports reports on WABC-TV's Eyewitness News in the seventies, and, as chairman of Global Broadcasting, operated WNWK (105.9 Newark NJ) for a decade after its previous licensee lost the station's license in 1982. Unless you're a game show aficionado, you've probably never heard of David Zinkin. But the Rochester native, who died Wednesday after a long battle with cancer, was an important link in the NERW chain, keeping us posted on radio and TV news from western New York during this column's early Boston-based years, filling us in on the worlds of cable news, local TV, free-to-air satellite, broadcasting history and many other topics after our move back to Rochester, and helping keep the computers at NERW Central up and running, too. David was also a close friend of your editor as far back as middle school, and his loss (at the far-too-young age of 37) leaves a big hole in this column. *A few callsign changes in NEW JERSEY: in North Cape May, WSJQ (106.7) becomes WKOE, picking up the calls that used to be on 106.3 in Ocean City (now WBBO 106.5 Bass River Township). No format change yet, but we'll be listening. NJN Radio has calls for its new 90.3 in Toms River: it will be WNJO, calls last heard in Trenton on 94.5, now WPST. And veteran Jersey jock Zach Martin is back on the Garden State airwaves, doing fill-in and weekend work at WDHA (105.5 Dover). Martin had been doing production at New York's WFAN. *The PD chair keeps spinning in PENNSYLVANIA's biggest market: Rick Vaughn is leaving WIOQ (102.1 Philadelphia) on Sept. 2. He's heading for Chicago's WKSC (Kiss 103.5), to replace the departing Rick Gillette. In Pittsburgh, market veteran Zak Szabo is the new afternoon host at Steel City Media's WLTJ (Q92.9). Down on the AM dial, the message boards have been buzzing about a new website at my660am.com, which appears to be pointing the way to a new sports-heavy format at WPYT (660 Wilkinsburg) beginning today. The lineup advertised on the website includes "The Kegs and Eggs Morning Show," focusing on outdoor sports, as well as a new 2-6 PM "Barstool Talk" sports-talk show. In the Scranton/Wilkes-Barre market, the AHL Penguins minor-league hockey team is changing affiliates this fall. The Pens will move from Shamrock's WEJL (630 Scranton)/WBAX (1240 Wilkes-Barre) to Entercom's "Mountain" WDMT (102.3 Pittston) under a multi-year deal. And we remember Paul Norton, whose long broadcast career took him from Olean to Albany to Buffalo's WKBW and WGR to the Voice of America before he landed in Philadelphia in 1959. After a year at WFIL (560), Norton moved across the hall to become a staff announcer at WFIL-TV (Channel 6), and he remained on the staff at Channel 6 (now WPVI) until his retirement in 1997. Norton died of a stroke August 7 at a nursing home in Delaware. He was 79. *In MASSACHUSETTS, there's a new program lineup at "ESPN Boston" (WAMG 890 Dedham/WLLH 1400 Lowell). With Mike Felger's departure for WEEI, WAMG has picked up the "Mike and Lew Show" that had been heard (as a leased-time offering) in morning drive on WWZN (1510 Boston). Mike and Lew are now airing from 4-6 PM on 890, preceded from noon-2 by a new show hosted by WCVB (Channel 5) sports anchor Bob Halloran and WAMG's Mike Salk. Down on the South Coast, UMass Dartmouth's WUMD (89.3 Dartmouth) was knocked off the air last Monday after a lightning hit damaged its transmitter. The station kept webcasting, and was back on the radio at low power by this past weekend. *The FCC is forcing Nassau to unwind a long-running NEW HAMPSHIRE JSA - and quickly. The license to what's now WWHK (102.3 Concord) stayed in the hands of Capitol Broadcasting (aka Vox) when Jeff Shapiro and Bruce Danziger sold the rest of their cluster to Nassau back in 2004, and while WWHK has been functioning as part of Nassau's Concord/Manchester/Nashua cluster ever since, it's been doing so under a JSA with Capitol. Nassau applied to buy WWHK outright in 2005, but the FCC dismissed the application, saying it would put Nassau over the four-FM limit for the Concord market. Nassau asked the FCC for a waiver, noting that the 102.3 signal had been "home" to the Manchester market at the time of the transfer application. But the FCC isn't buying the argument. It says Nassau should have ended the JSA in September 2006, when new rules went into affect that attribute JSAs and LMAs against ownership limits. Now the Commission is ordering the JSA to be terminated immediately, forcing Capitol to make other arrangements to sell WWHK's airtime - and it says the Enforcement Bureau will be weighing in on the case, too. Barry Lunderville is changing calls at his new AM signal in Berlin: WRTN (1490) will now be WKDR, a longtime Burlington, Vermont callsign. *Congratulations to VERMONT Public Radio, which will expand the reach of its classical service to the Route 7 corridor south of Burlington with the help of a newly-granted construction permit in Middlebury. The new signal on 90.1, with 1.2 kW/317' DA, will carry VPR Classical, replacing the present Middlebury translator service on W258AW (99.5). *In MAINE, we're hearing that the cutbacks at Blueberry Broadcasting (the former Clear Channel group) hit even harder than we reported last week: we're told that of the 34 people working for Clear Channel at the Augusta cluster, just 22 still had jobs once Blueberry took over. Three jobs were cut in Bangor when the deal closed July 29th. We're also hearing there may be some big changes coming at J.J. Jeffrey's Atlantic Coast stations: the rumor mill has sports WJJB-FM ("The Big Jab") moving to the big 96.3 signal now occupied by talker WLOB-FM, which would take WJJB's Topsham-licensed 95.5. We're also hearing that Atlantic Coast may replace rhythmic top 40 with WEEI's sports network on WRED (95.9 Saco). Up north, there are reports that Allan Weiner's new 94.7 in Monticello is on the air, playing classic country as "WBCQ-FM" (Weiner's Monticello-based shortwave station also has the WBCQ calls); the FCC database still shows 94.7 as an unbuilt CP with no calls, but a request for the WBCQ-FM calls was filed August 15. *In RHODE ISLAND, Arbitron released the revised version of the spring ratings, minus the six questionable diaries from a "media-affiliated" household in East Greenwich. With that extra WPRO listening subtracted from the numbers, John DePetro's morning show dropped from fourth to ninth place among listeners 25-54, though it remained in first place among all listeners 12+. WPRO's all-day 12+ numbers fell from first place to a tie for second. The station's maintaining "radio silence" (as it were) about the issue, and DePetro remains on the air at last check. *A quiet week in CANADA; in fact, the most exciting item we could dredge up comes from Barrie, Ontario, where CHAY (93.1) has rebranded as "FM93, Barrie's Fresh Music Mix." To the north, a proposed station sale that slipped by us when it was first announced back in May: Haliburton Communications, which is selling most of its English-language signals in Ontario to Newcap, also has a pending deal to sell its French-language network (CHYC Sudbury, CHYK Timmins, CHYX Kapuskasing) to Le5 Communications, helmed by Paul Lefebvre, for C$425,000. And Ron Laidlaw, who was the first news director at CFPL-TV (Channel 10) in London, running the newsroom there from the station's 1953 debut until his retirement in 1985, has died. Laidlaw was credited with Canada's first local commercial newscast in color, and was the second president of RTNDA Canada in 1965-66. Laidlaw died Thursday (Aug. 14); he was 88. Is there any other commercial station in MASSACHUSETTS that's been in the same hands as long as WCAP (980 Lowell)? The station signed on June 10, 1951, owned by Maurice Cohen and his two brothers, and while the brothers have since passed on, the station has remained under Cohen's control for all this time. That's about to change, as Cohen announced this morning on WCAP's morning show. He's selling the station to a group of local investors led by Chelmsford real-estate agency owner Sam Poulten, local developer Brian McMahon and Andover radio consultant Clark Smidt, under the "Merrimack Valley Radio, LLC" banner. "It's been almost a two-year courtship," Smidt told NERW, describing his long negotiations with Cohen for the purchase of the station. Smidt says he's known Cohen since the early seventies, but it was only in recent years that he began exploring a purchase of WCAP. "A good friend gave me the idea that rather than looking for stations in northern New England, this makes sense because it's right next door to me," Smidt said. The purchase, valued at $2,660,000, was financed locally by Lowell Five Cent Savings Bank, Smidt told NERW in a weekend interview. "The chairman of the board of the Lowell Five knew Mr. Cohen, knows the situation, believes in Lowell, and said if the fourth largest city in Massachusetts can't support a good AM station, he'd be surprised," Smidt said. The veteran consultant, whose Boston radio career included the creation of new formats at WBZ-FM (106.7, now WMJX) and WEEI-FM (103.3, now WODS) will be serving as WCAP's general manager once the deal closes. He promises that Cohen, who's nearing age 90, will continue to have an open door at the station. And he says he expects to keep WCAP's talk format, adding more local content and boosting the station's local sales efforts, which have flagged in recent years. It's been in the works for a while, but now the demise of another Bay State AM station has become reality. WPEP (1570 Taunton) disappeared from the airwaves last week, clearing the way for former sister station WNSH (1570 Beverly) to make a big jump in power. The latest version of the WNSH upgrade, for which a construction permit was granted in June, calls for 30 kW days, non-directional, from the present transmitter site on the Endicott College campus. WNSH's present 85-watt night signal will be unaffected. The elimination of WPEP will allow WNSH to drop the three-tower daytime directional pattern that must now null co-channel WPEP to the southwest (and even then, limits WNSH to 500 watts); it also removes a source of local programming for the Taunton area, which gets most of its "local" programming from Providence and Boston stations these days. In NEW YORK, we're still waiting for the official confirmation of the new morning team on WFAN (660) - but it sounds like it's pretty much a done deal that former football star Boomer Esiason and WKXW (101.5 Trenton NJ) afternoon host Craig Carton will be the permanent replacement for Don Imus on the radio side. We don't expect Esiason and Carton to be simulcast on MSNBC - that slot will likely stay with Joe Scarborough, who's been filling in on an interim basis - but we wouldn't be at all surprised to see YES Network end up carrying the show, just as it does the Mike and the Mad Dog afternoon show. "After 50 years in broadcasting...I'm retiring, effective in about 30 seconds." That was the way Steve Delaney signed off from VERMONT Public Radio on Friday, as he handed off his "Midday Report" noon anchoring duties to the new daily "Vermont Edition" that will debut today. Delaney spent much of his career in the field, including more than 20 years as an NBC News correspondent. He later worked for Monitor Radio before joining VPR in 1997. Delaney will continue to contribute to VPR newscasts; Mitch Wertlieb will be the new noon news anchor, leading into Jane Lindholm as "Vermont Edition" host. Bloomberg's WBBR is designed to stay on the air no matter what (two generators, two separate transmitter facilities, a UPS and a backup studio at its New Jersey transmitter site), and it did. WABC stayed up and running with only minor technical glitches; its programming was less smooth, however, as it moved from the scheduled Sean Hannity show, to news broadcast from the ABC network radio facility on West End Avenue, back to Hannity (who planned to send affiliates a taped "best-of" show but ended up going live to the nation with blackout coverage) from the WABC studios, and into the night with Steve Malzberg and Monica Crowley mixing news and rumors. Less fortunate broadcasters included WFAN, which had trouble getting its generators working at its Astoria studios and its High Island transmitter and was off the air until just before the Yankees game, which it then picked up from WCBS, the Mets having been blacked out at Shea. WFAN then simulcast WCBS overnight before running a best-of Imus show on tape from the transmitter. Later Friday, Jody McDonald drove to Philadelphia to do the midday show from sister WIP - and then Chris "Mad Dog" Russo did five hours of live talk from the transmitter site, with no phones! WFAN was back to Astoria in time for Friday night's Mets game. WINS lost power late in the afternoon at its New Jersey transmitter site, returning later in the evening with coverage that was simulcast on WNEW, which went "Blink"less from its auxiliary transmitter at the WINS site. On the TV side, the Empire State Building was mostly dark, as only a handful of stations had generator facilities in the cramped transmitter spaces there. We've already noted that WCBS-TV (Channel 2) maintained its tradition of always being on in a crisis - but we neglected to note that WNBC (Channel 4) also had a generator at Empire that enabled it to stay on the air until 1 AM, when its live coverage (from the emergency studio 6C at 30 Rock, and later from a sixth-floor balcony) ended and the station shut down the generator overnight to move to its auxiliary facility at the Armstrong tower in Alpine, N.J. WABC, WPIX and WNET were all on from Alpine, it appears; WNYW and WWOR were off the air until late Friday when power was restored at Empire. (And Pax's WPXN stayed on the air from its New Jersey transmitter site with infomercials and Pax programming...) One more note: Cable TV news is not a useful medium in a blackout - and Time Warner's New York 1 proved the point, going off the air when the power (and cable) went out and staying off through midday Friday. In MASSACHUSETTS, John "Ozone" Osterlind is taking an involuntary two-week break from morning duties at Entercom talker WRKO (680 Boston) after learning the hard way just where the boundaries to his "bad boy" act lie. Early last Tuesday morning (August 12), Osterlind and co-host Peter Blute were reportedly discussing the Palestinian situation when Osterlind suggested that the solution would be to eradicate the Palestinians. That was too much for station officials (though afternoon host Howie Carr can refer to "towelheads" without penalty) - and Osterlind was sent to the beach for two weeks, with a variety of guest hosts filling in. A familiar station identity is back in CANADA, where Corus pulled the plug on "Energy 93.1" up in Barrie, Ontario - replacing it with soft AC sounds as "The New CHAY 93.1." The CHAY calls never legally disappeared from the powerful station north of Toronto, but they haven't been used much on the air recently; the move leaves just one remaining "Energy" station from Corus' chain, the 103.1 facility in London. There's been a lot of speculation over the last few months about the fate of American Radio Systems' Boston stations -- even an article in another radio column just a few weeks ago that authoritatively claimed Jacor would be the next owner of WRKO, WEEI, WAAF, WEGQ, and WWTM. As of this afternoon, the rumors are over. David Field's Entercom is paying $65 million to buy the stations from CBS, which was required to sell the stations as part of the antitrust settlement of its purchase of ARS. CBS also gets two Entercom stations in Tampa, WYUU (92.5 Safety Harbor FL) and WLLD (98.7 Holmes Beach FL). Although it's based in Philadelphia, Entercom's first entry into the Northeast radio market came just last year with its purchase of the former Heritage Media group in Rochester. The Boston (and Worcester) stations are the company's first entries in New England. What happens now? Let's put NERW in analysis mode here and take a look at Entercom's new prizes: WRKO (680) tops the list in both ratings and prestige. With nearly two decades under its belt as a talker (after those 14 glorious years as a top-40 rocker), the 50 kilowatt giant remains a solid ratings performer, despite some recent turbulence in morning drive. Entercom's background is more on the FM side than AM, but recent acquisitions of AM giants like Seattle's KIRO and Kansas City's KMBZ and KCMO suggest that the company is getting more comfortable on the other side of the dial. With solid performers like Dr. Laura, Rush Limbaugh, and locally, Howie Carr in the afternoons, changes at WRKO seem unlikely. WEEI (850) and mostly-simulcast WWTM (1440 Worcester) have carved out a solid niche in the sports arena, fending off competition from the now-defunct sports weekend at WBZ (1030), as well as the mostly-syndicated fare on WNRB (1510). Along with WAAF, they'll give Entercom a solid footing among younger male listeners. On the other side of the equation, neither of WEEI's major sports franchises (the Red Sox and Celtics) has been performing well of late, and despite WEEI's 1994 move from 590 to the former WHDH at 850, it's still saddled with a directional signal that misses many western suburbs at night. WWTM helps by day, but is no more effective at reaching Framingham or Natick after dark. Entercom's only other sports outlet is KFXX in Portland, Oregon. Last on the list, but perhaps the most interesting, is WAAF (107.3 Worcester). For years, WAAF has tried to pretend it's actually located 40 miles east, even though its signal within the city of Boston can most kindly be described as "variable." But with the help of plenty of advertising dollars, along with publicity that can't be bought (like last spring's "Mayor Menino is Dead" April Fools' stunt), WAAF continues to do fairly well in the ratings. What's more, its active rock format is Entercom's specialty. So what happens next? Well, another Entercom specialty is frequency and call shifts. This is the company that traded KCMO's 810 dial spot for WHB's 710 in Kansas City, flip-flopped its sports (KFXX) and nostalgia (KKSN) outlets in Portland, and moved the legendary WBBF calls from AM to FM in Rochester. Could WAAF finally become a legitimate Boston signal on 93.7, with Eagle getting regional reach on 107.3 (a signal which regularly draws ratings as far away as Springfield)? Wouldn't surprise us. One more note before we move on to the rest of the week's news: Besides keeping hot AC WBMX (98.5), CBS is hanging on to one other ARS station. WNFT (1150) was not included in the Entercom sale, which leads NERW to wonder what CBS has in mind with this often-ignored station that's currently pulling R&B oldies off the satellite. Could WBZ finally get the overflow outlet that it's wanted for years? With the Justice Department satisfied, could 1150 now be flipped to sports? And what of CBS's stated committment to find minority buyers? Is WNFT's current format a clue? We don't know...but we'll keep you posted. We'll start the rest of this week's news in NEW YORK with the sale of Albany's second public TV outlet. Sinclair has agreed to pay $23 million for WMHQ (Channel 45), with the station returning to commercial operation once the sale closes (it began its life in the 80s as commercial independent WUSV before being sold to WMHT), either as a UPN or WB affiliate. Sinclair gets an upstate New York sweep with this one -- they now own or are purchasing WUTV (Fox) in Buffalo, WUHF (Fox) in Rochester, and WSYT (Fox, with an LMA on UPN affiliate WNYS) in Syracuse, as well as a large radio group in Buffalo.